The scene of the attack in the Midway District on Dec. 5, 2018. 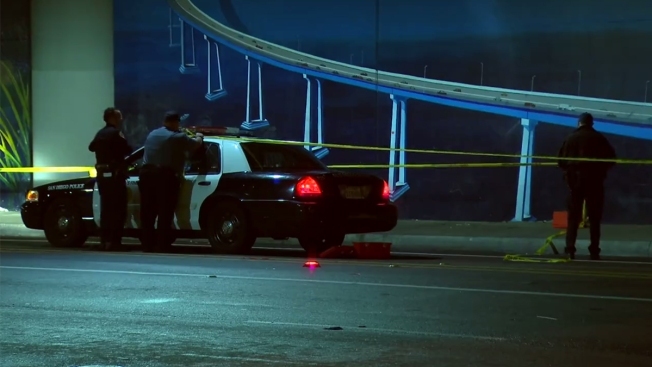 A man is in grave condition after being attacked near a freeway bridge in San Diego’s Midway District, police confirmed. At around 5 p.m. Wednesday, officers with the San Diego Police Department (SDPD) were called to 3900 Rosecrans Street – near the Interstate 5 overpass – to investigate reports of an assault. There, police discovered a 57-year-old man suffering from trauma to his upper body. SDPD Lt. Anthony Dupree said the man was taken to a local hospital but is not expected to survive his injuries. Dupree said a witness told police that the victim had been on the ground when an unknown man began to hit him with some sort of object. The attacker fled the area before police arrived. Investigators cordoned the area near the bridge. Apparent blood splatters could be seen on a concrete wall as officers placed evidence markers around the scene of the violent attack. The suspect was described by police as a man in his 20s wearing a yellow poncho and blue jeans. As of 8:45 a.m. Thursday, he remained at large. Given the victim’s dire prognosis, homicide investigators are handling the case. The victim’s name has not yet been released. Anyone with information on this attack can reach out to police at (619) 531-2293 or Crime Stoppers at (888) 580-8477.